This summer and fall, intern Bianca Barcenas is helping analyze and map the rich data on Catholic readers in the 1840s book trade ledger maintained by the Jesuits at St. Louis. In this first post she turns to Catholic almanacs in order to get a sense of the parameters of Midwestern Catholicism during the period covered by the ledger. Over the summer, I have been digging through copies of the Metropolitan Catholic Almanac (MCA) published in 1841 and 1851 seeking to trace the growth of Catholicism in the Midwest. The MCA was published annually from 1838 to 1861 in Baltimore by Fielding Lucas (and by other publishers after that). It includes information such as feast days, a list of clergymen, and information about each diocese in the United States. Searching the MCA offers not only a look at the expansion of Catholicism through the eyes of Catholics, but also provides insight into the context in which Jesuits of the Missouri Province maintained their trade in books between 1842 and 1850. In this research, I have uncovered where Catholic authorities chose to focus their expansion within each diocese, as well as where across the Midwest as a whole. 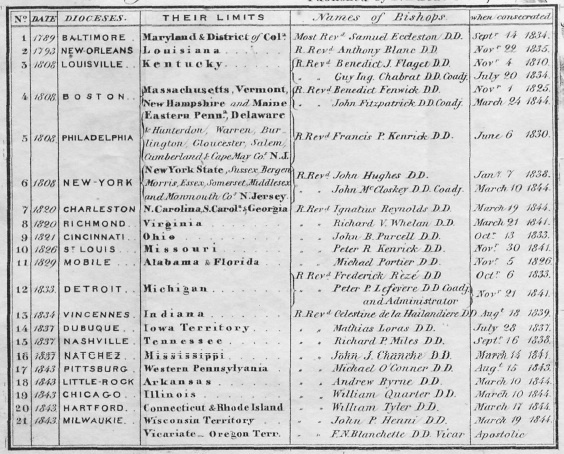 List of Catholic Dioceses in the United States in order of founding from the Metropolitan Catholic Almanac (1845). Collection of American Antiquarian Society in Sabin Americana. Mid-nineteenth century Catholic dioceses were named after cities but encompassed whole states. For example, in 1841, the Diocese of Detroit comprised of not just the city of Detroit, but also the entire states of Michigan and Wisconsin. 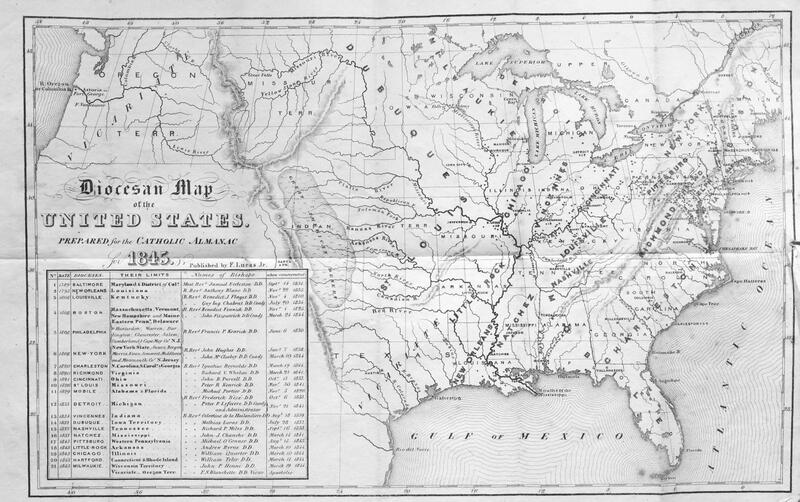 A “Diocesan Map of the United States” (below) prepared for the 1845 MCA visually demonstrates how far Catholicism had spread by that point and also provides a valuable key (above) listing each diocese, when it was incorporated, the territory it covered, and its bishops. “Diocesan Map of the United States. Prepared for the Catholic Almanac for 1845.” Collection of the American Antiquarian Society in Sabin Americana. The most striking boundaries in the 1845 map, however, are not state lines but rivers. Transportation by river was key before the introduction of the railroad at mid-century. Each of the dioceses in the Mississippi River Valley is centered along the Mississippi River, or a branch of it. In 1841, nine dioceses were established either on or near the Mississippi River. At its southernmost point, the Diocese of New Orleans sits at the mouth of the river. Going north, the dioceses of Mobile and Natchez contribute to the Catholic scene in the Southern US. The dioceses of Nashville, Bardstown, and St. Louis lie at the center of the Mississippi River’s trail. Finally, the dioceses of Vincennes, Dubuque, and Detroit make up the Catholic population in the northern part of the Midwest, with not just the Mississippi nearby, but also Lake Michigan. The Jesuits enjoyed such a wide market for their book trade because they were centered at St. Louis, and had access to these waterways that led them to other Midwestern dioceses. 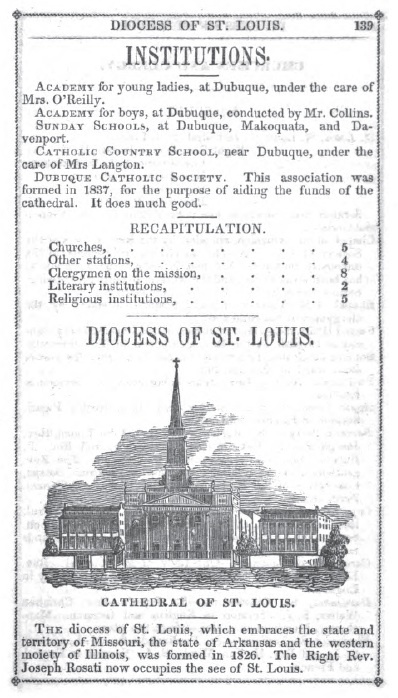 Page from the 1841 Metropolitan Catholic Almanac. The MCA includes short summaries or snapshots of each diocese. In the diocese lists, the publisher included established churches, the priests that attended them, and all major institutions in the diocese with descriptions. What I have uncovered so far by analyzing the summaries of each Midwestern diocese is that Midwestern Catholicism in 1841 focused much on the expansion of faith and education through the creation of churches, stations, and institutions. The MCA divides its recapitulation data into the number of churches and stations separately. Churches are gathered congregations with physical buildings dedicated to the practice of the Catholic faith, sometimes with a resident priest attending that parish. Stations, on the other hand, can be thought of as missions, where priests and other clergy members traveled to towns without established parishes in an attempt to teach, administer the sacraments, and lead worship for a period of time before moving on to the next station. Priests in each diocese also played a significant role in expanding Catholic influence. Out of the eight dioceses established in the Mississippi Valley area, only Dubuque had priests visiting less than twenty other stations, as only four stations existed in that diocese. In most dioceses, not only were clergy members attending established churches, but they were also traveling in order to convert those in more rural areas and attend to those who could not travel into towns. Priests physically expanded Catholicism through these stations. Half of the dioceses had an equal number or more of outside stations compared to churches established in the diocese, as shown in the chart below. Reverend Raho of St. Louis, for example, not only attended six churches in the Diocese of St. Louis, but also saw to at least six other stations. This section of the data shows how every diocese values the influence of the Catholic Church even in areas without established parishes. The goal for the Church was growth and conversion in this time. The number of churches (blue) and stations (orange) for each Midwestern diocese in 1841. (Date of incorporation next to name of each diocese.) Source: Metropolitan Catholic Almanac. Catholic education was both religious (related to vocations) and literary (related to lay schooling), as many dioceses supported seminaries and convents alongside primary schools, academies, and colleges. These terms come from the almanacs, as they have numbers dedicated to “Religious Communities,” “Literary Institutions,” “Religious Institutions,” and so forth. Theological seminaries and Female Convents were common in many of these dioceses. Colleges, schools, and female academies were popular literary establishments. Female academies, such as the Convent and Academy of the Ladies of the Sacred Heart in St. Louis, were often run by women religious in that particular community. While there are a number of Catholic men’s colleges in 1841, more of the educational influence focused on younger children. More day schools, literary schools for boys, and female academies worked to spread Catholic education than at the college level. 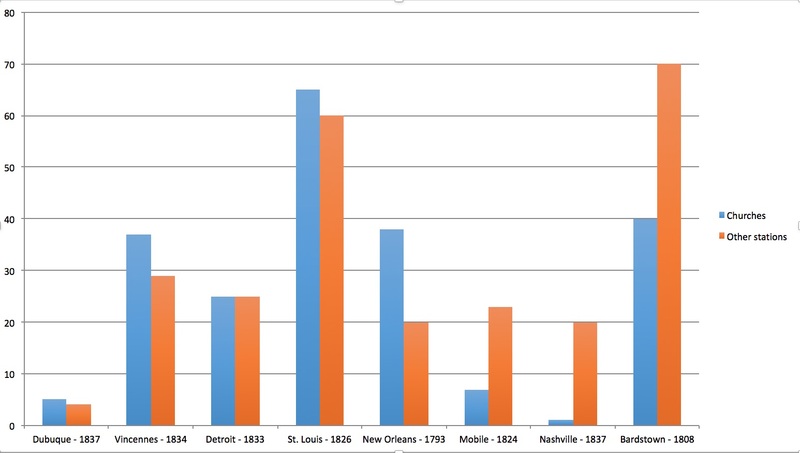 From the data in the 1841 MCA, St. Louis was the clear center of Midwestern Catholicism. Established in 1826, the Diocese of St. Louis started out as the largest diocese in the United States, encompassing all territories west of the Mississippi River, until other dioceses were created from within its borders (Dubuque, Chicago, Little Rock). Catholics established sixty-five churches there, along with sixty stations visited. (This number is only ten less than Bardstown, which had the largest number of stations scattered across the Kentucky countryside). Over seventy total clergymen resided in the diocese, overseeing the two ecclesiastical seminaries, two colleges, ten female academies, eight charitable institutions, four primary schools, and ten convents. With such a spread in terms of institutions and inclusion of rural areas of Missouri and Southern Illinois, the diocese of St. Louis was definitely the center of Midwestern Catholicism at this time. Expansion of the faith seems to have preoccupied newer dioceses more than education, leaving the latter an outlier until the diocese becomes much better established. After a decade, Catholicism in the Midwest was still growing. Three new dioceses were established in the Mississippi River Valley in 1843 at Milwaukee, Chicago, and Little Rock. These dioceses comprised the states of Wisconsin, Illinois, and Arkansas, respectively. Instead of being parts of the dioceses of Detroit, Vincennes, and St. Louis, the Catholic population in each of these areas grew enough to warrant an independent diocese. Also, the diocese of Bardstown from the 1841 almanac changed that very year to be the diocese of Louisville, possibly because of larger population growth or even because Louisville is situated along the Ohio River, which branches from the Mississippi. The number of churches (blue) and stations (orange) for each Midwestern dioceses in 1851. Source: Metropolitan Catholic Almanac. In 1851, stations continue to be key in the expansion of Catholicism in the Midwest. In newer dioceses (those with fewer established churches), stations often outnumber churches. For example, the Diocese of Nashville only had eight churches, but twenty stations. Similarly, the Diocese of Little Rock also maintained eight churches, but clergymen oversaw twelve stations as well. 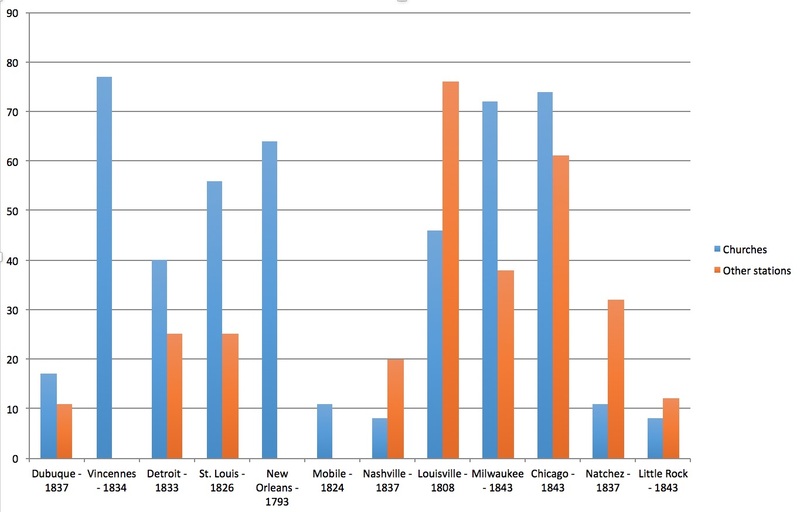 From the 1851 almanac, it appears that the ratio of churches to stations remained similar to that of 1841 (see chart above), however the data is a bit skewed because the dioceses of Vincennes, New Orleans, and Mobile did not include the numbers of stations in the 1851 almanac. Priests still remained key to the expansion of Catholicism in the Midwest, however this growth did not occur evenly across the Mississippi River Valley. The Diocese of Nashville, established in 1837, built one church and saw to twenty stations by 1841. After a decade, the diocese had only built seven new churches and maintained the same number of stations. This is surprising compared to dioceses such as New Orleans or Vincennes, where the number of new churches built over the decade was twenty-six and forty. Unfortunately, the 1841 almanac does not include estimated Catholic populations, so it is hard to say whether or not the growth rates reflected population or other factors. Schools for various audiences were still being opened and run in significant numbers into 1851. The dioceses of St. Louis and Louisville recorded more educational institutions than any other. There was also an increase in the number of charitable institutions, where Louisville recorded fifteen at the highest amount, compared to St. Louis’ eight in 1841. Numbers are few for religious institutions in most dioceses, however, because much of this data was not included in the 1851 almanac. Only Chicago included numbers for female convents, and Dubuque and St. Louis recorded the number of general religious institutions for 1851. By 1851, the new dioceses of Chicago and Milwaukee were poised to surpass St. Louis and New Orleans in the number of churches established. With seventy-four and seventy-two churches, respectively, they had grown quickly, while in St. Louis the number of churches decreased from sixty-five to fifty-six. (This was probably caused by the creation of the dioceses of Chicago and Little Rock, as St. Louis used to maintain all of Missouri, as well as Arkansas, and Western Illinois.) However, St. Louis still maintained many schools, academies, and other religious institutions. Other dioceses surpassed St. Louis in numbers of specific types of schools and academies, but St. Louis still ran more institutions overall compared to the other dioceses in the Mississippi Valley. While the diocese of Vincennes documented the most churches (numbering seventy-seven), and New Orleans the largest Catholic population (about 170,000), the dioceses of Milwaukee and Chicago were the centers of Catholic growth in the mid-nineteenth century. Each diocese created a handful of academies, institutions, and communities. The number of churches in the process of building (twenty-nine for Milwaukee, and fifteen for Chicago) was a testament to their commitment to growth and access to faith. Not only does this data from the MCA reveal the growth of dioceses across the Midwest, it also reveals the diversification of Catholic initiatives. In 1841, the Catholic Church in the United States recorded its growth by the number of churches, stations, and institutions, so the reader could see the end result each year. Ten years later, those numbers were still recorded but contributors also noted the number of churches being built, missions in Native American Territories, and an estimate of the Catholic population in each diocese. In the end, these numbers reveal not only the competition between Catholics and Protestants (who regularly recorded and published their own growth numbers) but also competition within dioceses to prove their development over the years. In all, the Jesuits of the Missouri Province certainly had a rapidly expanding market for their book trade.